There is nothing better than a gift of goodies from a friend’s backyard! This little package of sunshine could not have arrived at a better moment since we were bracing for a major snow and ice storm here in Atlanta (yes, you heard that right…Atlanta). Nothing says warm temperatures and sunshine better than a gift box of beautiful citrus fruit…especially when they are sent from a friend! First you blanch the Meyer Lemons and then add Kosher salt. I was really torn trying to decide what to make with my Meyer Lemons. I wanted to make something sweet like this beautiful Meyer Lemon Almond Cake from Merry Gourmet or some lemon curd to use in a dessert, but I opted for the Preserved Meyer Lemons. This will be the gift that keeps on giving since I will be able to use them over the next several months. I am really looking forward to using the preserved lemons in a savory dish in the next few weeks after they have had time to marinate in the salt and their own delectable juice. It takes a good bit of salt to preserve the lemons. 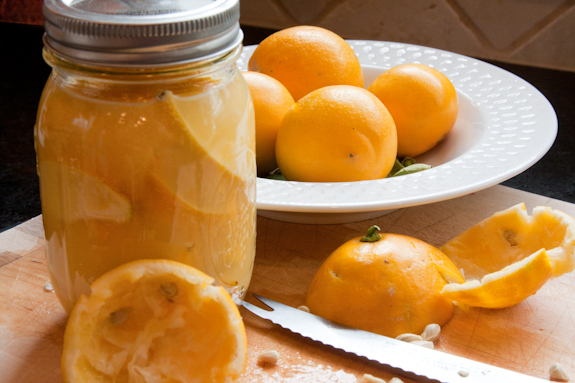 Making preserved lemons is very easy. I made half of the recipe (adapted from Gourmet), so I had a few more lemons leftover from my stash from Kim! 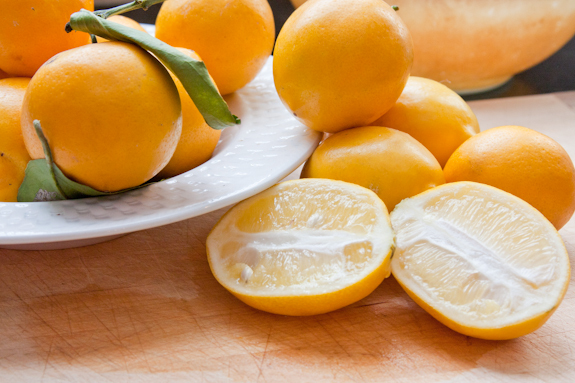 Cover the lemons with fresh squeezed Meyer Lemon juice. They will hold for one year. I debated about the preserved lemons but Meyer Lemon Curd is something I just can’t pass up . . . neither is Limoncello . . .
Those two were on my list as well! Even my Aunts are cranking out the Limoncello in Florida…that’s next on the list and the juice can make the lemon curd! Yay! YES!!!! I was JUST thinking about making these. A great post, my friend! Thanks! I can’t wait until they are “preserved” enough to use in a dish! It’s so easy to do this…can’t believe I haven’t done it before. Mr. B said he turned them just right for the photo shoot! 😉 You should definitely preserve some…I can’t wait to use these in some dishes! Besides…I saved a few for something special! Thanks again!! Looks absoulutly lovely, I love lemon curd too will you be making that soon? Besides chocolate, lemon is my next favorite flavor. Yum! What a great way to make use of those delicious lemons! Isn’t this amazing? I’m due to get some of her lemons soon, and I feel so blessed. What a great way to use this gift. I’m going to try to do the same with my batch. Thank you for sharing this with me! I hope you have a wonderful afternoon. Hey Gwen, a super belated happy new year to you! Also, thank you for reminding me that I am a TOTAL IDIOT and forgot about the amazing preserved lemons a friend gave me and I put safely away in my cupboard!! this sounds wonderful! i am going to try this someday… i have this bookmarked. thank you for sharing this. Oooo! Your friends are WAY better than friends in high places! Lucky girl. Ooooh! Meyer lemons!!! You lucky, lucky girl!!! Can we trade friends? I have yet to even see a Meyer lemon 🙁 I would have been so torn between preserving them and turning them into curd! But, these are beautiful!! I have never had a Meyer lemon so I can’t really say one way or the other if I am floored by them or not. But I am a lemon fan! Living in France we can buy preserved lemons at every market and we do! My husband uses them in preserved lemon and olive tagines and I’ve made a chicken recipe with them. They are brilliant to have around! Honestly, this is the first time I’ve heard of preserved lemons, but they look so pretty in the jar! Pingback: Making Lemon Curd |You Made That? My neighbor just gave me a large bag of lemons. I am sure they are not Meyer, but seem to be Eureka and Lisbon lemons. She said the tree is so heavy the limbs are breaking, would I please take them off her hands. Can I make preserved lemons with these lemons? The thickness of the skin is definitely thicker than the Meyer. I would like to try, but I am not sure what to do with them after they are preserved. I have already made curd and with some I will squeeze into ice trays and freeze for later use, but I am really interested in preserving. Your thoughts please. And this morning another neighbor left two large rosemary bushes at my back patio. And I thought Christmas was over. I am so excited. You can use regular lemons for preserving. 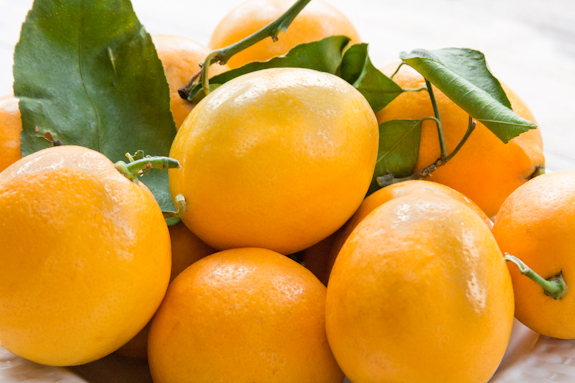 Meyer Lemons are favorites to preserve because of their great flavor and the fact that they are not available all year long. I would be sure to scrub the skins well, if they are not organic, before preserving them. Preserved lemons are great in a number of dishes and are found quite a bit in Mediterranean cooking. 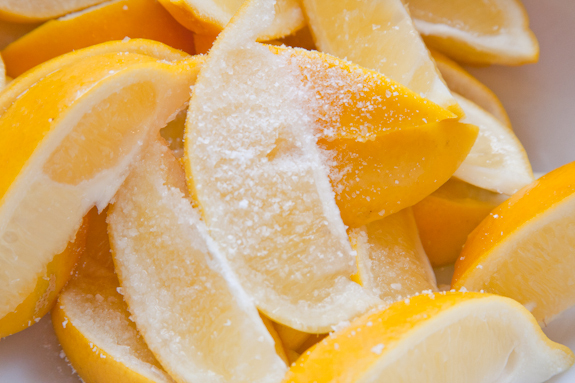 I have one recipe using preserved Meyer Lemons on my site. You could try that with your regular lemons once they have been preserved. https://www.pratesiliving.com/2011/02/chicken-tagine-with-green-olives-and-preserved-lemon/. 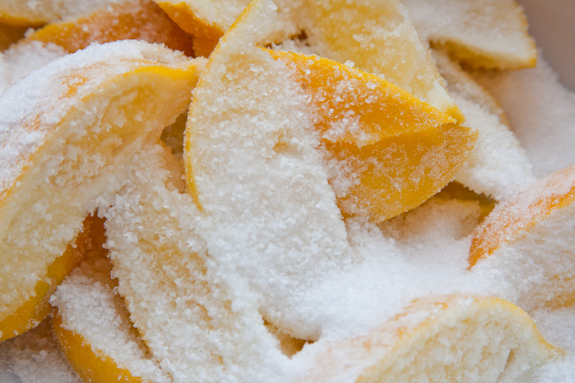 You might have to adjust the seasonings a bit since Meyer Lemons are not quite as tart. If you do a search for “recipes using preserved lemons” there is quite a list on Google. I’ve been looking for this recipe for awhile. Meyer lemons going on the stove right now. I’m obsessed with them, too. Smoked oysters and a thin slice of a Meyer lemon on top of a Ritz cracker……..out of this world!